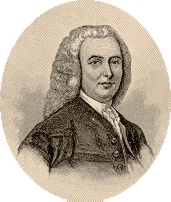 Historical Biographies, Nova Scotia: William Shirley (1694-1771). Shirley was known for his antipathy towards the French, particularly those located in Nova Scotia: the Acadians.3 His feelings on this subject, I suppose, were established as he made his rounds as the King's Surveyor. He would have had to carry out inventories of the great trees to be found on the frontiers as then existed: the back lands of current day Maine and New Hampshire. The frontiersmen would have continuously expressed their fear, dread and hate; that they, understandably, had of the French. (The butchery that was carried out by the French led Indians from Quebec is legendary; though, by the 1740s, the worst of it was over.) So, too, as a "merchant governor" Shirley could see what the predatory practices of certain French seamen working out of Louisbourg were doing to shipping costs. For these reasons, and for the general thirst for military adventure, Shirley was to become "the chief factor in inducing the Colonies to attack Louisbourg" in 1745, a subject which I treat in my history. During the momentous year of 1755, when the English determined to hit the French in four places at once, Shirley was to head up an attack on the French posts located in an area we now know as upstate New York; he failed in achieving his objectives. (Only Monckton, put in charge of the expedition against Fort Beausejour, Acadia, was to achieve success.) Thus, with the close of 1755 there was a lot of blame to past around.10 Shirley was relieved of his gubernatorial duties in 1756 and made to return to England. After enquiries were made, Shirley was exonerated and given a high level command in the army. In 1761, Shirley was appointed as the Governor of the Bahamas. Shirley's son took over his father's position in the Bahamas in 1769; and with that Shirley went into retirement. He settled in Roxbury, Massachusetts were it is said he built a large house. On March 24th, 1771, the seventy-seven year old William Shirley, died. See the further Portrait of Shirley which we have scanned in. See Dr. Webster's The Forts of Chignecto where there is a brief write up on Shirley. As quoted by Webster, Shirley was of the view that "the most obnoxious inhabitants of Nova Scotia" ought to be forcible removed; a plan that was to be carried out by Lawrence beginning in 1755. A Half Century of Conflict (vol. 2), pp. 66. New England's Outpost , p. 109. The boundary question was never to be sorted out between the two countries, and, after 1763, the question became moot, at least as between France and England. Winsor's Memorial History of Boston 1882, vol 2., p. 62. It was on April 14th, 1755 that the governors of the British colonies (Dinwiddle of Virginia; Dobbs of North Carolina; Morris of Pennsylvania; Sharpe of Maryland; Delancy of New York; and Shirley of Massachusetts) met at Alexandria on the Potomac (known in history as the Council at Alexandria). [Parkman, Montcalm and Wolfe (vol. 1), pp. 198-201.] The French were to be attacked, notwithstanding that the two countries were at peace, at four points at once: General Braddock and his regulars were to attack Fort Duquesne (Pittsburgh); Shirley against Fort Niagara; Colonel William Johnson, Crown Point; and Colonel Monckton, Acadia. Shirley and Johnson simply did not achieve their objectives. As for Braddock: on July 9, 1755, he and his troops were ambushed and sustained a terrible defeat just seven miles before arriving at their objective, Fort Duquesne (Pittsburgh); Braddock lost his life.